The par 72 South Course is designed in the classic parkland style, similar to the golden age courses of the teens and twenties. The South Course utilizes existing terrain and natural features to define each hole. In the parkland style, holes are framed with sporadic trees and native grasses. There are four sets of tee markers to challenge golfers of all skill levels. The course measures 6953 yards from the back tees and carries a U.S.G.A. course rating of 73.2 with a slope rating of 125. The Charleston Springs golf complex features a fully stocked golf center, food concession snack bar, locker rooms and showers. The warm-up range has grass tees and six target greens. The well-manicured practice putting green is over ½ acre in area and has 8 target cups. SGA Rules: Clinic use has priority ~ Must have daily greens fee ticket for use (A $10 fee, payable at the Pro Shop) applies if you do not have a same day greens fee.~ Must use own golf balls ~ Carts must remain on path ~ Repair balls, replace divots, rake bunker when finished ~ Player closest to green has right of way ~ Small range tee reserved for clinic and instructional use only. NOTE: Tee times at Charleston Springs Golf Course are available on a first-come, first-served basis and cannot be reserved through the Reservation System. Copyright © 2010 CharlestonSpringsGolfCourse.com. All rights reserved. DISCLAIMER: This website is provided “as is” without any representations or warranties, express or implied. 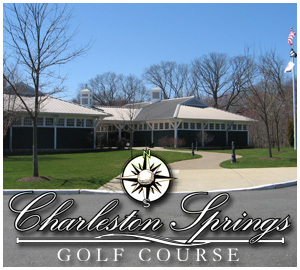 CharlestonSpringsGolfCourse.com makes no representations or warranties in relation to this website or the information and materials provided on this website. Without prejudice to the generality of the foregoing paragraph, CharlestonSpringsGolfCourse.com does not warrant that this website will be constantly available, or available at all; or that the information on this website is complete, true, accurate or non-misleading. Nothing on this website constitutes, or is meant to constitute, advice of any kind.